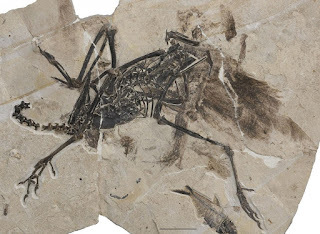 Exceedingly well-preserved bird fossil specimens dating 50 million years represent a new species that is a previously unknown relative of the modern-day ostrich, according to a new paper co-authored by Sterling Nesbitt of Virginia Tech's College of Science and part of the university's Global Change Center. "This is among one of the earliest well-represented bird species after the age of large dinosaurs," said Nesbitt, an assistant professor in the Department of Geosciences. "You can definitely appreciate how complete these fossil are," added Nesbitt of the remains, the focus of a research paper co-authored by Nesbitt and newly published in the Bulletin of the American Museum of Natural History.